Have you ever felt like this? Have you ever wondered if somehow you missed God? Never Give Up addresses these questions and gives us the answers plus the practical application to rectifying the situation. 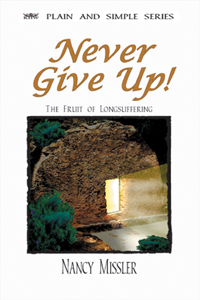 Most of us talk very openly about the need to “be like Christ” and to have His characteristics of Love, joy, peace, but what about thefruit of longsuffering—the determination never to give up? God promises us that He will strengthen us; help us and uphold us, even through the difficult times. The question is: How do we do our part? How do we, like Paul, patiently endure our trials by never giving up? That’s what this book is all about. Chapters in Never Give Up! Blessings from Never Giving Up! We just want you to know how much your book Never Give Up has blessed and instructed us in the principles of victorious Christian living. We have a group of women who are reading and discussing the book. We seldom get more than 2 pages a meeting done. It is just a great object for discussion. We have also taken it to a home Bible study: it has been wonderful. Thank you for your sensitive Plain and Simple Series. Learn more about “Never Give Up” with these supporting materials. I was crying out to the LORD… again, ..this is has been a long , deep, dark trial. The times when HIS voice is so faint. Almost silent. With No Answers. listen carefully, -ask seek knock but no answers. ..
.. the long dark night. I never thought I could be so wicked but I am. I was that vulnerable- devastated, and wide open to temptation. I do not blame my husband(s). .. I DO see how someone who is so devastated can fall. I am 52 years old now. ..and all I wanted to do is work! ..
many Christians are given over to idolatry.. I can sense the demonic prescense !!! P.S. I sat under your teaching when I was a baby Christian in Big Bear Calif.
never,, ever could I settle for lame .. unbiblical teaching after you guys !!! you really have no idea how much you impacted my life!